← Highlights from the 2013 Season! An unexpected cold front has coated the city in a fine slick of ice and powdery snow and bitter winds whip along the narrow streets of this corner of DUMBO in Brooklyn, stubborn winter seemingly unaware that it is nearly May. Temperatures have dipped into the 40’s, though with the wind blowing off the nearby East River it feels even colder — colder, certainly, than the tropical African climes most of our group is accustomed to. 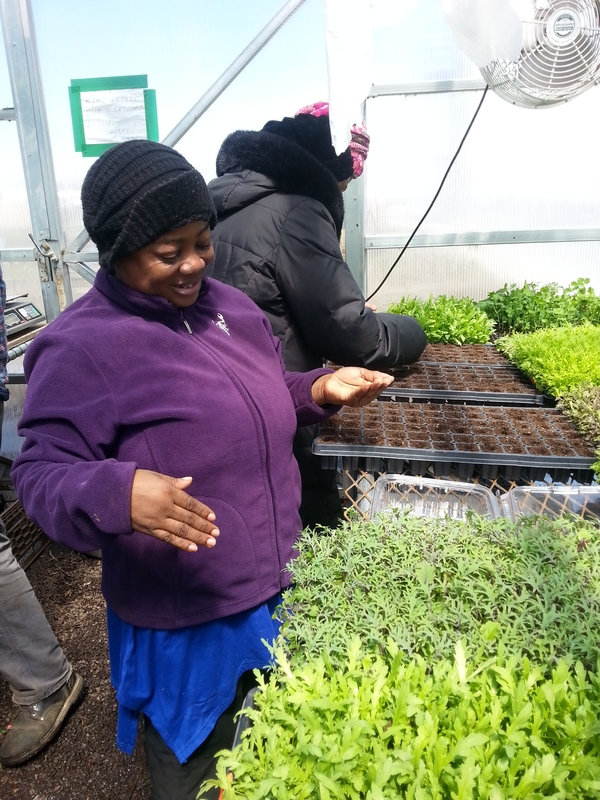 Today is the first day of the 2014 growing season for RIF’s newest group of participants — refugees and asylum seekers rebuilding their lives in New York. 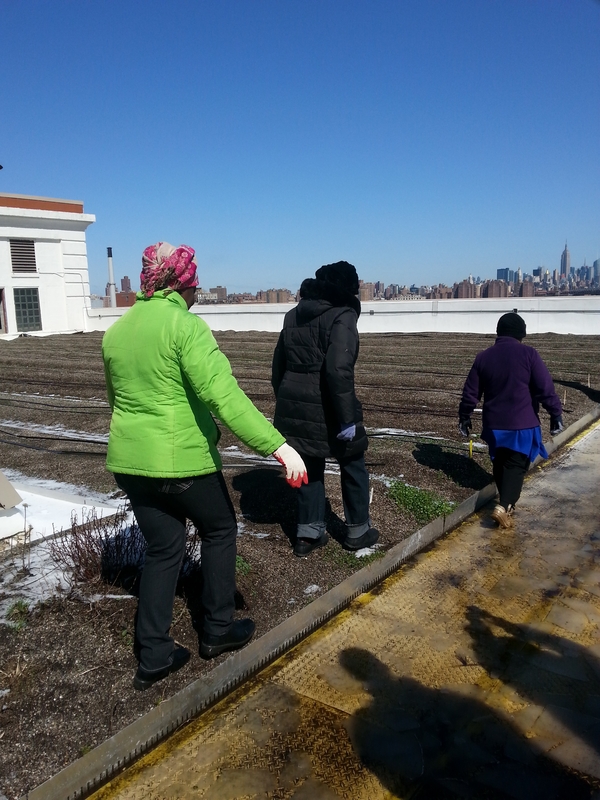 Through RIF’s Urban Farm Project and in partnership with Brooklyn Grange, the world’s largest rooftop soil farm operating in Brooklyn and nearby Long Island City, Queens, they will spend the next six months learning the ins and outs of the city’s exploding urban agriculture scene. From seeding, to harvesting, to preparing boxes of fresh vegetables and herbs for the local CSA program; the Farm Project will provide them with an immersive English environment and the confidence and entrepreneurial skills necessary to succeed in their adopted country. And for many, the sprawling farms, overlooking the Manhattan skyline and soon to be teeming with flowers and vegetables, will become an escape from the hard realities of life as a refugee in a strange city. The Brooklyn Grange Navy Yard farm frosted over. 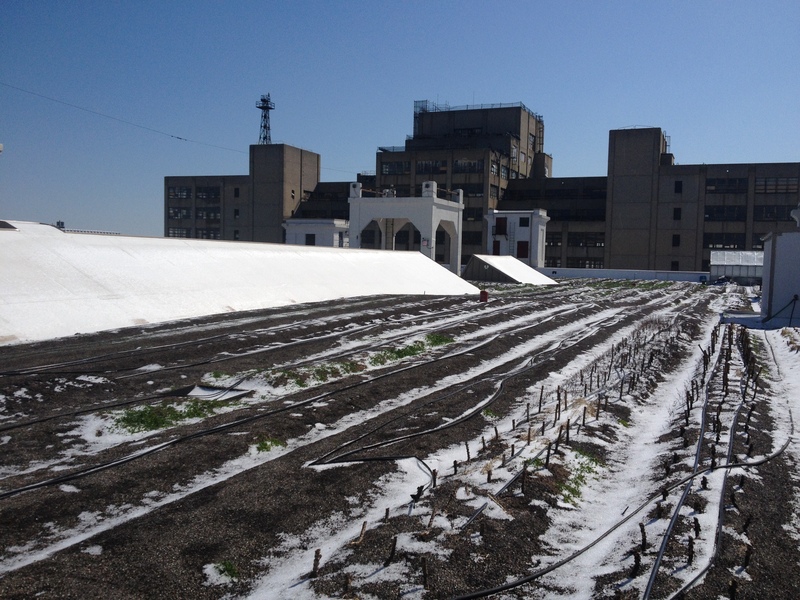 On this bitterly cold day in the Brooklyn Navy Yard, however, that green promise of spring seems far off; the previous night’s storm has turned the farm into a rooftop skating rink, the rows of dirt and compost frosted over. Still, the group of RIF trainees (the other half of the season’s participants are at the LIC farm) glides carefully along the ice behind farm manager Matt, cold but intrigued. Maria, RIF’s founder and a social worker by profession, thinks for a minute, but a translation for the trendy greens escapes her. “C’est un type de salade,” she offers, laughing. The ladies — O., K., and C., hailing from Guinea, Senegal, and Congo — nod in understanding, chatting in French or Wolof. O., K., and C. traipsing across the farm. The farm rises above the sprawling complex of the Brooklyn Navy Yard, a former ship-building mecca that has been reborn as a bustling hub of art, commerce, and industry, not to mention home to a growing number of the city’s pioneers in sustainability. The Navy Yard’s Employment Center has helped past RIF participants with resume building workshops, and successfully guided one through the application process for the Made in NY Production Assistant Program, an introductory training and job placement program for the city’s film industry. Between the Yard’s vast professional network and the contacts made with other interns and visitors to the farm, RIF’s participants are exposed to a trove of opportunities in the city, and the assistance to pursue them. Matt leads the group across the rest of the farm, sunlight reflecting off the thick sheets of ice as interns, braced against the wind, till the long rows of soil. The ladies are introduced to the farm’s six heritage breed chickens, clucking happily. Over the wall of the roof, the Navy Yard’s cranes rise up against the backdrop of downtown Brooklyn. We all cramp into the Grange’s greenhouse, a veritable sauna at a balmy 70 degrees. Tables line both walls, holding trays of hundreds of seedlings to be planted in the coming weeks. With the fans humming, the smell of the soil heavy in the damp air, and the sunshine permeating the greenhouse’s plastic-sheeted walls, the cold of the morning is forgotten and maybe too, for a moment, the hardships endured over the past months and years. The group lingers in the warm space and laughs as Matt goads the women into trying spicy mustard greens. Back outside, Maria and Matt debate calling it a day; even with the bright sun directly overheard, it’s clearly too cold for farming. Turning back to the group, however, they find that O., K., and C. are off in the field, shovels in hand. The warm respite in the greenhouse — or the spicy kick of the mustard greens — has reinvigorated them, and they balk at the idea of going home early. “Énergie! Énergie!” K. chants, and the others laugh in encouragement. Maria and Matt shrug and smile, the new season underway. Thank you, all, for this important and satisfying work you are doing!